Sunset at the Old Ski Bowl. The Everitt Memorial Highway climbs its way up the southern flank of Mount Shasta, ultimately reaching an elevation just over 7,800 feet. It is one of the highest paved roads in California and, among roads in the Northstate, second only to Highway 89’s ascent of the southern slope of Lassen Peak. The road was initially paved so that it could provide access to the Ski Park that was built during the 1950’s in what is now known as the Old Ski Bowl. Skiing operations continued until 1978 when an avalanche wiped out the park. Less than a decade later, the ski park reopened at a new location on the mountain, lower in elevation and without the danger of avalanches. The road up to the Old Ski Bowl remained and continued to be used by those who loved Mount Shasta. This came as no surprise since the Everitt Memorial Highway continued to provide quick access to the stark beauty of the Old Ski Bowl and the nearby serenity of verdant Panther Meadows even if the ski park was gone. Much of the year, the Everitt Memorial Highway only goes as far as Bunny Flat, a somewhat level clearing on Mount Shasta that is at about 7,000 feet. During winter the road is only plowed this far up the mountain. However, once the snows have melted, the gate closing the road is opened and it is possible to continue driving a couple more miles up Mount Shasta to both Panther Meadow and the Old Ski Bowl. Though the two destinations are separated by nearly 1 mile of road, it is a tightly switchbacking, steeply climbing mile, meaning that they are closer than the mileage indicates. They are also connected by a short, easy trail. Moreover, it is possible to gaze down on Panther Meadow from the Old Ski Bowl. Consequently, though they are two very different destinations, the bowl and the meadow form one large use-complex. Indeed, in the summer and fall months, this area sees the most concentrated use on the mountain. 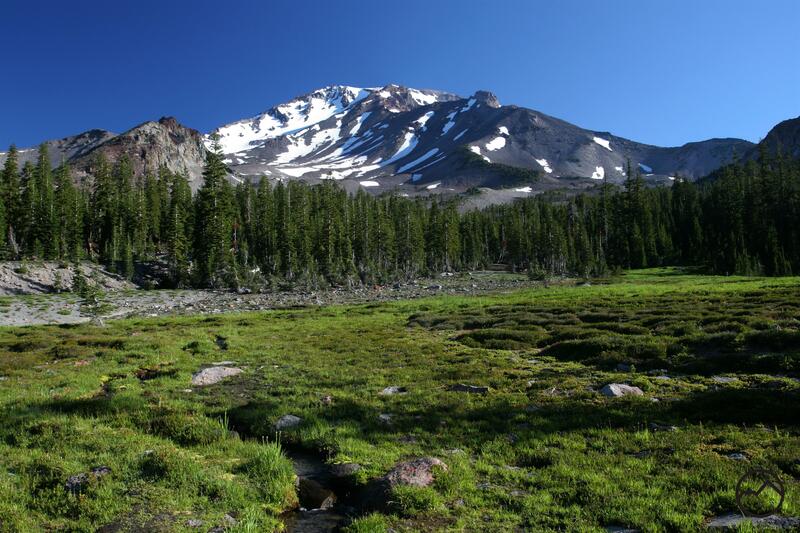 Mount Shasta looms above Panther Meadow. 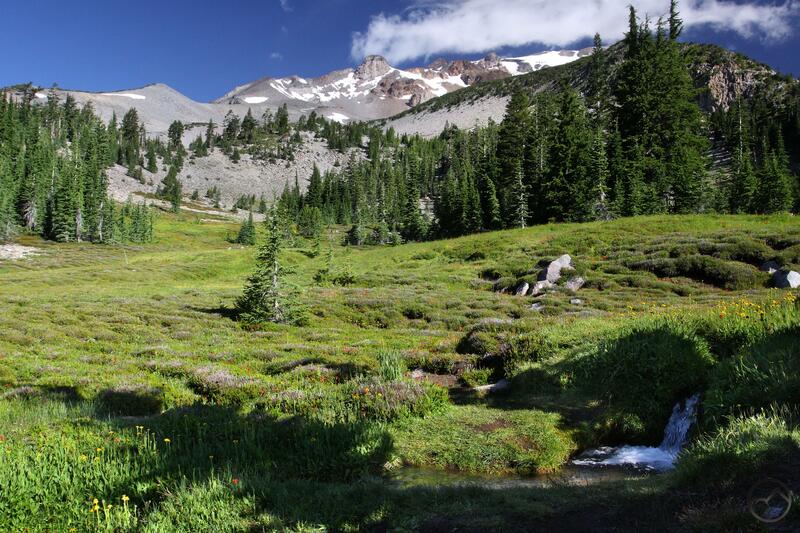 A perennial favorite of hikers, strollers and seekers of all kinds, Panther Meadow is by far the most easily accessed garden on Mount Shasta. It is an easy stroll of only a few yards from the parking area before one is deposited on the edge of a lush, well-watered meadow. Wildflowers abound and small streams course through the grass. The water originates from the Panther Springs at the north end of the meadow. Looking to the north, the great cone of Mount Shasta seems to float above the meadow. To the east, the sheer silver walls of Gray Butte mark the horizon. It is, by any standard, a very beautiful location. Such beauty does not go unnoticed and though it is never crowded, Panther Meadow is rarely bereft of visitors. This is exacerbated by the presence of a Forest Service campground immediately adjacent to the meadow. Literally the end of the road, the Old Ski Bowl is a spectacular destination on Mount Shasta. For those with limitations that prevent them from exploring the mountain on foot, the Old Ski Bowl offers an opportunity to get a taste of what the mountain’s hinterland is like. Nearly at treeline, the bowl is a stunning, barren basin set between Green Butte Ridge and Sargents Ridge. Green Butte, Shastarama Point, Thumb Rock and the area just below the summit of Mount Shasta (the actual summit is just out of sight) all preside in lofty isolation above the parking area at the end of the road. To the south, views of the Castle Crags, Grey Rocks, the Trinity Divide and the jagged horizon of the Trinity Alps give visitors a sense of the great elevation they have achieved. Like at Panther Meadow, Gray Butte is also a presence at the Old Ski Bowl. Whether sunrise, a daytime picnic or a glorious sunset, the Old Ski Bowl is a fantastic destination for a quick Mount Shasta fix. 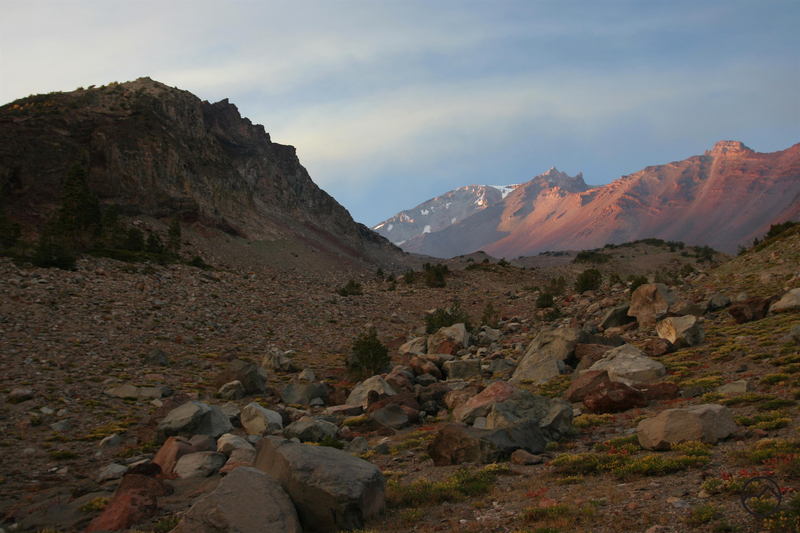 The south side of Mount Shasta is naturally the busiest part of the mountain. This is understandable considering the paved access to the high country and the incredibly convenient location of the Everitt Memorial Highway. The road begins right in town, next to the high school. It is only minutes away from Interstate 5. 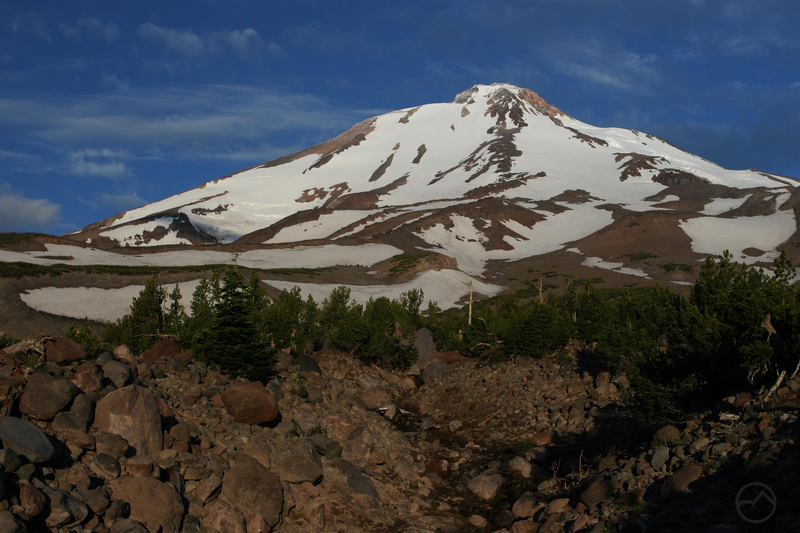 Six trails, which is over half of the trails on Mount Shasta, begin on the road. Two start at Bunny Flat, two, the Gray Butte and Panther Meadow Trails, at Panther Meadow and one, the Old Ski Bowl Trail, at the Old Ski Bowl. 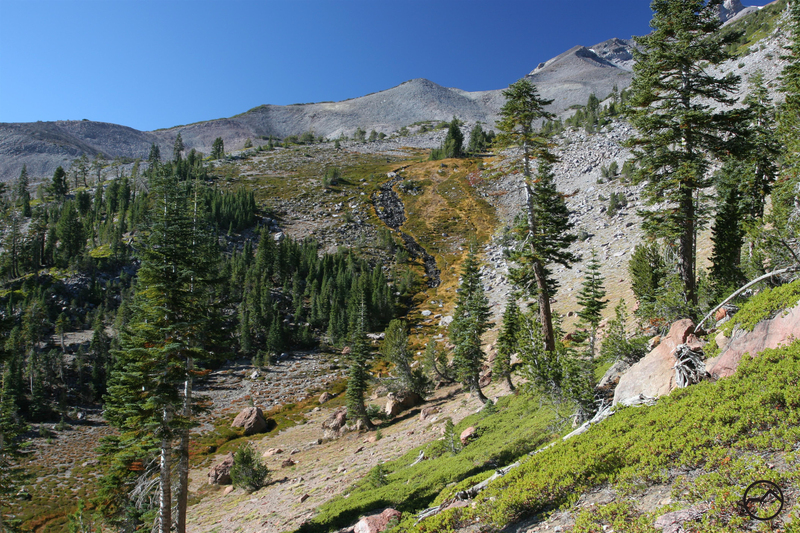 A final hike to Squaw Meadow (in this hiker’s opinion, the finest on Mount Shasta) has trailheads at both Panther Meadow and the Old Ski Bowl. 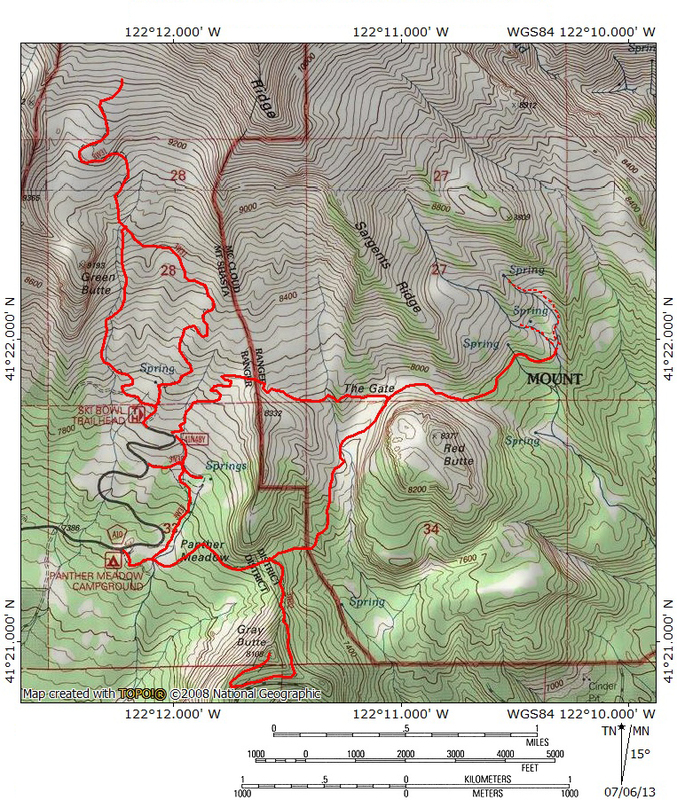 The two trailheads plus the use of the Panther Meadow Trail allows this hike to be done as a loop. 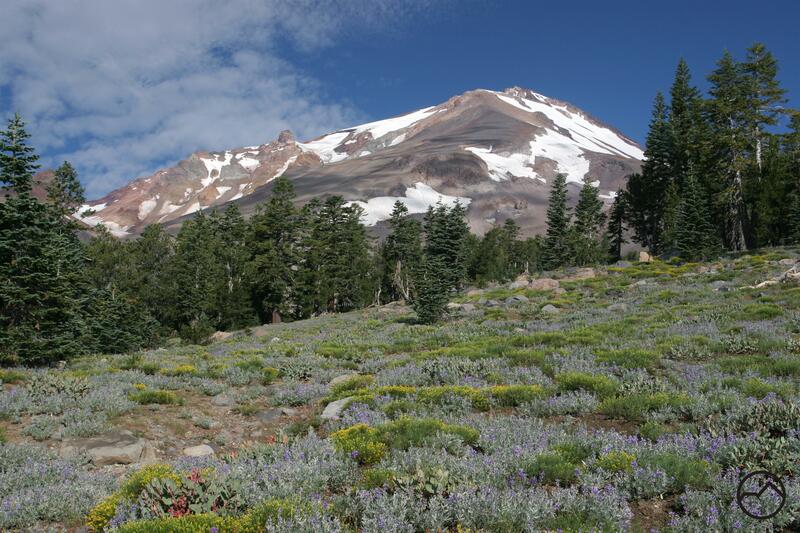 Located next to the popular Panther Meadow campground, Mount Shasta’s most famous garden is one of the most scenic spots on the mountain. With awesome views of the summit and other landmarks including Green Butte, Shastarama Point, Thumb Rock and Casaval Ridge, the trail is an easy opportunity to enjoy the spectacular scenery as well as the serene setting. The southern half of the meadow sees more traffic than its northern counterpart. 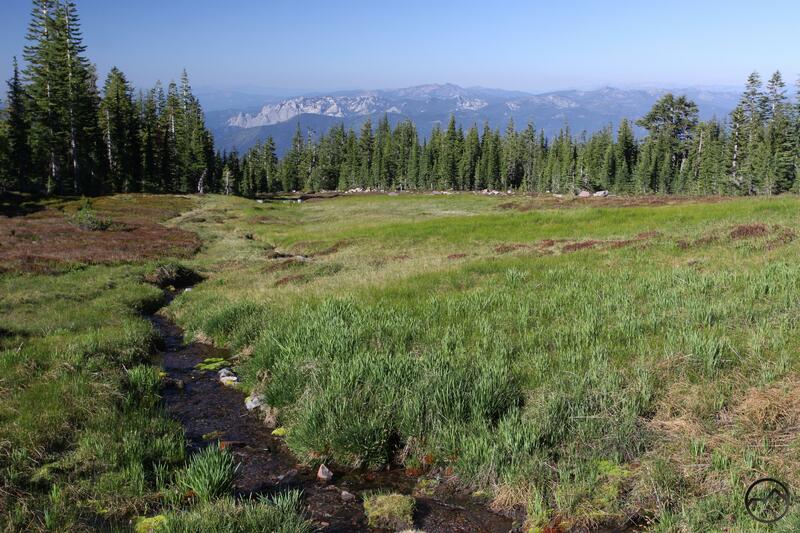 This is due to its proximity to the campground, the passage of the trail to Gray Butte and Squaw Meadow and some people lack of awareness that there is another part of the meadow. The short Panther Meadow Trail climbs from the campground along the edge of the lower meadow before entering a dense glade of hemlock. From there it follows the spring-fed creek upward until emerging at the edge of the lush upper meadow. The trail splits and makes a loop around this area, with a short spur to the spring. Excellent views of the Castle Crags and Trinity Divide add to the already wonderful views of Mount Shasta. Castle Dome and the Castle Crags seen from Panther Meadow. Mount Shasta viewed from the summit of Gray Butte. 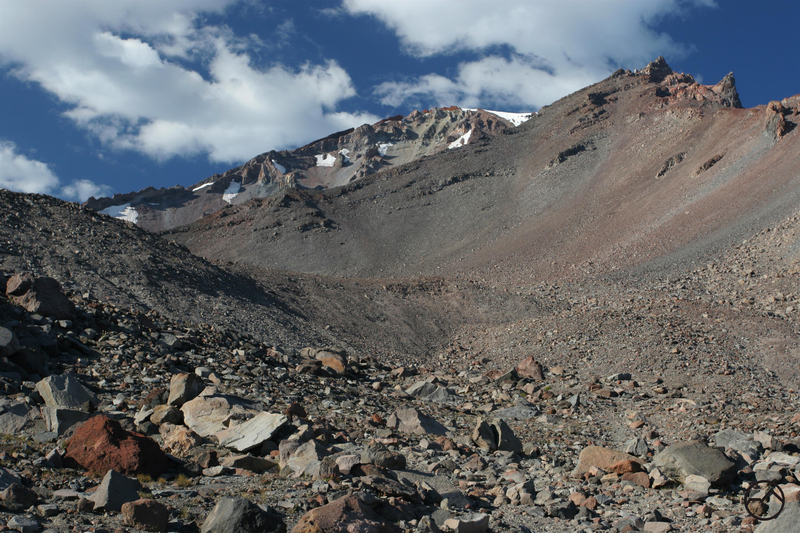 The climb to the summit of Gray Butte is the shortest trail on Mount Shasta. In such a spectacular location short by no means necessitates a boring hike. 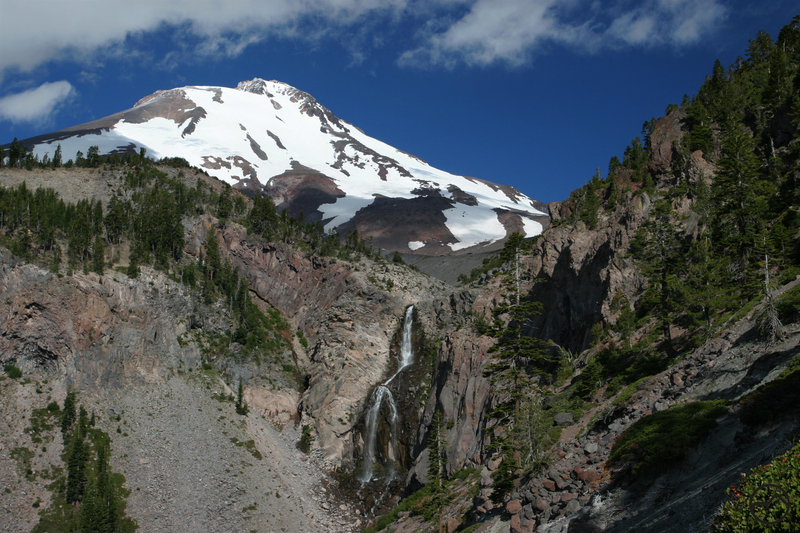 The trail initially passes through Panther Meadow and then climbs through a glorious Red Fir forest. Numerous large, old-growth firs populate the area, as do lots of large boulders that make fun scrambling opportunities for kids. 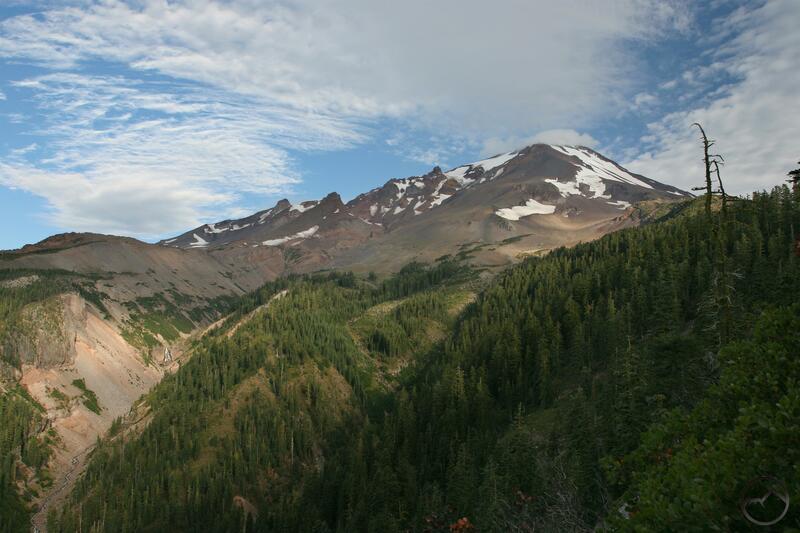 The trail climbs to a pass between Gray Butte and a rocky, unnamed ridge. Here the trail separates, with the eastward path leading to Squaw Meadow and the southward trail continuing to Gray Butte. Beyond the junction the Gray Butte Trail passes through an excellent hemlock forest as it skirts the east side of the butte. Below the trail a valley separates Gray Butte from its more remote and impressive cousin, Red Butte. Eventually the trail swings around and heads north up a ridge to the summit of Gray Butte, a spot known as Artist’s Point. From here a grand view of Mount Shasta and much of Northern California’s greatest mountains unfolds. The upper reaches of the Old Ski Bowl. Old Ski Bowl Trail The trail climbing into the heart of the Old Ski Bowl was once the access road that serviced the chairlift and other aspects of the now gone ski park’s infrastructure. 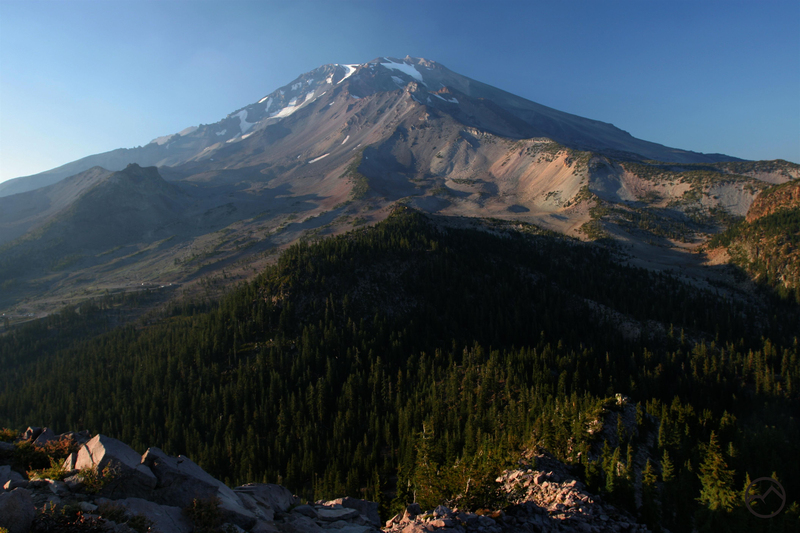 Now it makes a great hike up into Mount Shasta’s barren volcanic hinterland. The addition of a few connecting use trails and some additional old service roads has made this trail into a loop. It begins climbing immediately, swinging to the east side of the bowl. It then begins a long traverse to the west, seemingly headed for the base of giant Green Butte. 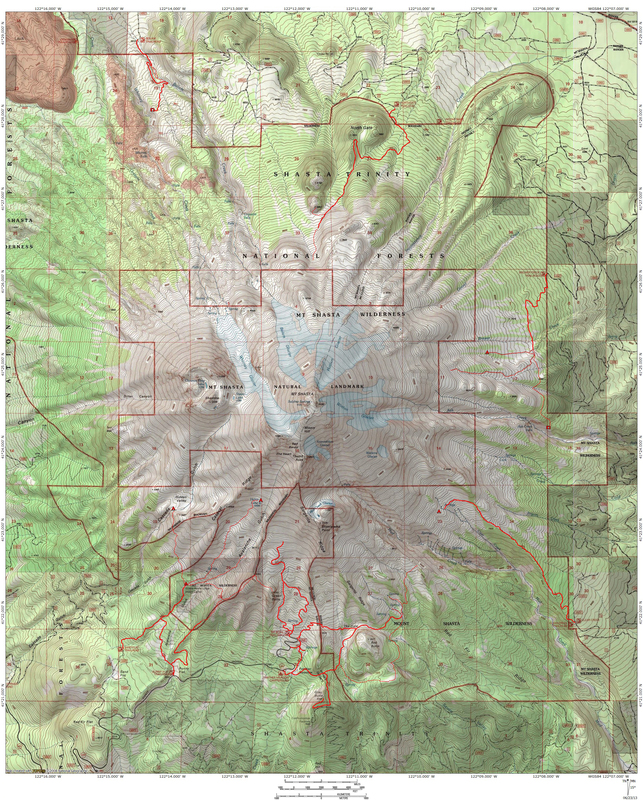 It soon becomes apparent that Green Butte is harder to reach than previously appeared and that there is a hidden valley on the north side of the lightning rod-like peak. The Old Ski Bowl Trail begins to encounter ruins and relics from the ski park in the area. The trail continues to wind its way north, toward an obvious bench where the last few krummholtz trees hug the bench’s rim. Atop the bench is a large complex of concrete and steel ruins, remnants of the top of the ski park’s chairlift. Beyond this point the trail climbs into a vast screefield below Thumb Rock, where the trail eventually peters out. On the way back down, near the base of Green Butte, the obvious loop option splits off of the main route and heads south toward the parking area. In addition to great views of Green Butte, the trail passes a small, lush spring, the only water of consequence found in the Old Ski Bowl (there are some other seeps but they never have running water). 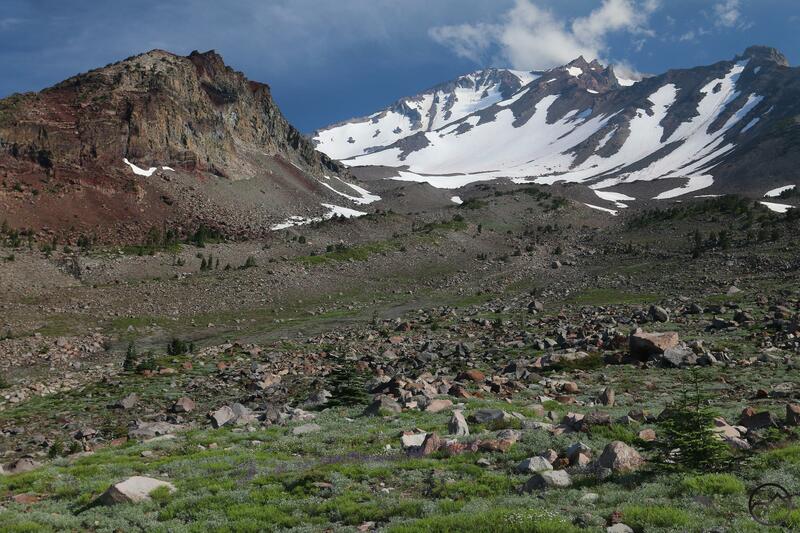 Possibly the finest hiking on Mount Shasta, the trail to South Gate/Squaw Meadow (see the trail description for details on the name) has everything one would expect from a premier trail on a premier volcano. 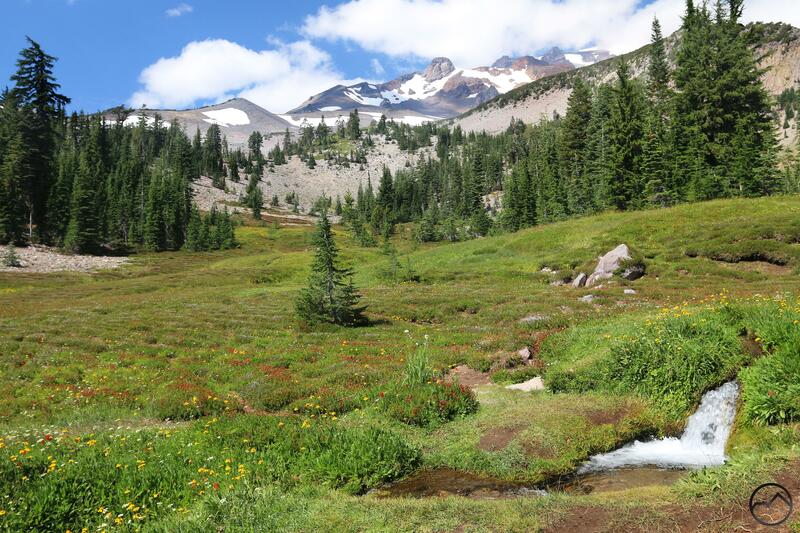 Excellent views of Mount Shasta and distant mountains, old-growth forests, volcanic wastelands, lush meadows, abundant water and cascades, lots of room for spectacular off-trail exploration and even a sense of deep isolation are found on this hike. Beginning at Panther Meadow, the trail climbs to the junction where the Gray Butte Trail heads up to the butte’s summit. From here the Squaw Meadow Trail dips down to a barren valley and skirts the base of Red Butte. After passing through South Gate (a narrow gap between Red Butte and Sargents Ridge), the trail passes through more old-growth before depositing hikers at the bottom of the meadow. Lots of running water, originating from numerous springs, runs through channels cut into the lush grasses. Halfway between the trail and the top of the meadow, the water runs over a 100 foot high, increasingly vertical cascade. Great views of Mount Shasta are to be had, especially from the bottom of the meadow. An off-trail scramble leads to the rim of massive Mud Creek Canyon and a view of Konwakiton Glacier and Falls. After passing through South Gate on the trip back, turn west at a junction in order to follow the loop option. Beyond the junction, the route climbs through Hummingbird Meadow to a pass overlooking the Old Ski Bowl. Proceed down through the bowl to the Old Ski Bowl trailhead. An unofficial but obvious trail departs the east end of the parking area and completes the loop by connecting to the Panther Meadow Trail. The scenery and views are magnificent for the entire hike.